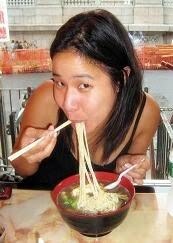 Believe it or not, I didn't always realize how much I loved soup noodles. Noodles were just a simple lunch that my mom used to make for us all the time when I was growing up. But once I left for college and stopped getting my twice-weekly (or more) dose of soup noodles, I found it was the one thing I craved most on visits home. As the Cinderella song goes, "Don't know what you've got, 'til it's gone." When constructing a perfect bowl of soup noodles, the basic elements are: homemade broth (usually pork or chicken), noodles (vermicelli, bean threads, korean wheat noodles, fresh egg noodles), protein (fish balls, won tons, grilled chicken, or tofu), vegetables (lettuce, spinach, baby choy sum, broccoli), condiments (chile oil, fried shallots). Using some combination of those five variables, I have made countless bowls of soup, each a delicious, nutritious meal in a bowl. It is the one food I never tire of, my default lunch, my go-to hangover cure, the dish I ate on my wedding day and would unquestionably choose as my last meal. My mom's house was never without the two key condiments mentioned above, and earlier this year, I vowed to always keep them in my house as well. Neither is particularly difficult to make, and I make it a point to replace them as soon as I run out. Together, they transform even a lazy-day bowl of noodles into something special. 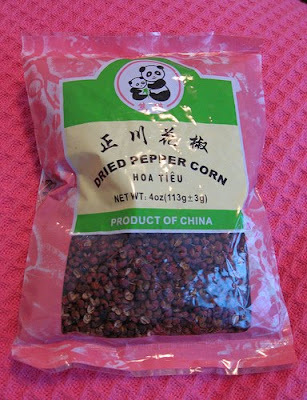 Until fairly recently, Szechuan peppercorns were illegal in the U.S., a situation that sends a little shudder of fear down my spine. I'm addicted to the numbing quality of this spice, which is not really a pure chili heat, but more of a tingly quality that I've described to people as "your tongue on e." These come in a packet that is marked simply "dried peppercorns" and I always amuse myself when I imagine some unsuspecting person accidentally using these in place of pepper. This oil is a great way to spice up soup noodles, but it's also tasty in dry noodle dishes, stir-fries, in dumpling dipping sauce, etc. 1. Heat oil in a heavy-bottomed pan on high for about 1 minute. 3. Cook on high for about 3 to 4 minutes. Peppercorns should brown, but not burn. You will smell them releasing their slightly floral fragrance (you may also want to turn your vent on). 4. Turn heat to medium low and cook for another 2 minutes or so. 5. 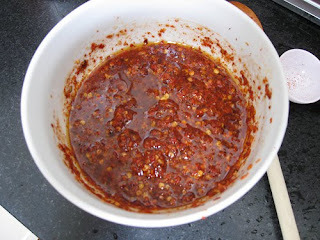 Place your red pepper flakes in a medium-sized bowl and add just enough water to form a thick, dryish paste. 6. Pour the peppercorn-infused oil through a strainer onto the damp chile flakes. 7. Allow to cool and keep in an air-tight jar in the fridge for up to 6 weeks. 1. Dice shallots. Make sure pieces are roughly the same size. 2. Pour enough oil (approximately ½ cup) to cover the surface of a heavy-bottomed pan completely. 3. Cook shallots on medium-high heat for about 20 to 25 minutes, until they are golden brown but not burnt. Shallots will become translucent and hardly change color at all for the first 15 minutes or so, but will start to brown relatively quickly at the end, so keep a close eye on them after the 15-minute mark. 4. Add generous pinch of salt and remove from heat. 5. Using a slotted spoon, remove shallots to paper towels to drain. Note: The shallot-flavored oil can be refrigerated and used for stir fries or salad dressings.